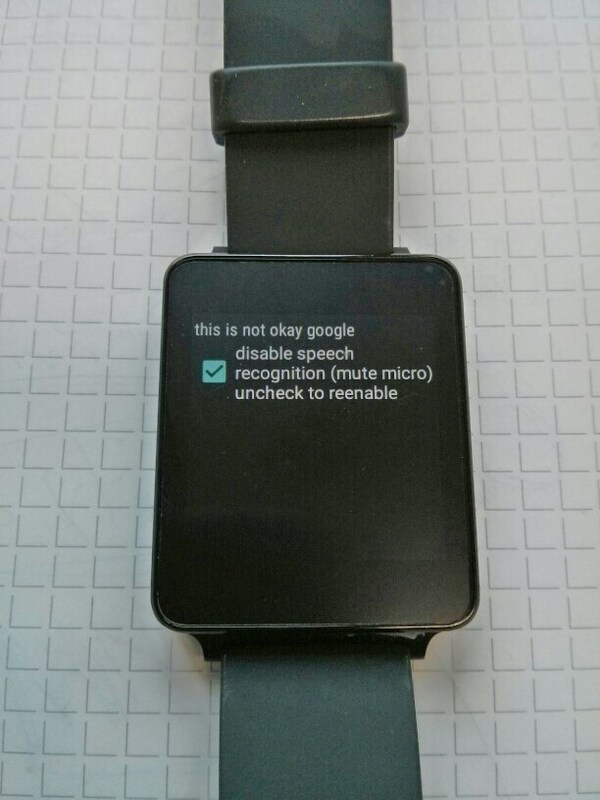 A nice feature for Android Wear devices (smartwatches) is the integrated speech recognition. If you don’t like to use it all the time, you are lost, because Google has left out a configuration setting to disable the speech recognition. It is only disabled if you set your watch into flight mode. But the smartwatch becomes completely useless in this mode, even the time can be displayed incorrectly. Every time you lift your hand, the watch is listening for the activation sequence – it is listening!. If you don’t like to wear a bugging device at your wrist all the time or don’t like to allow processing of your speech samples in cloud services (like me, yes I’m paranoid ;-), you need an app to mute the microphone. Permanently running speech recognition can also be dangerous and expensive. For instance somebody nearby, or on TV says “OK Google dial 0900-XXXX” and the phone dials an expensive number. Since I was unable to find such an app, I started to code my own. The app needs the right to change audio setting. Privacy statement for the App. Speech synthesis is a nice feature for embedded systems and tiny computers not only for home automation. In case of lacking display a sound (speech) output may be a cheap alternative to provide the user with information. For example a mobile device, which gets an IP address via DHCP in changing environments is able to announce its IP via speech output even if no connection to the Internet is established. I have realized this feature before in 2006 to remotely control an ActiveMedia Pioneer 3AT mobile robot via web interface. In 2006 I have used Mbrola-TTS for this task. espeak -ven "hello world this is raspberry pi talking"
The alsamixer command is required to select the phone jack as output, default is the HDMI out. To get much better speech quality out of your Raspberry Pi I would recommend the open source Android SVOX pico TTS engine. It supports high quality speech generation in five languages (en [uk|us], de, fr, it, es). I am using the same TTS engine for my free Pediaphon Wikipedia TTS service. SVOX pico is the best open source TTS engine available for Linux. Unfortunately there is no prebuild binary available in the Raspbian distribution. 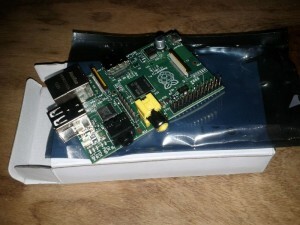 But is is possible to build it from source yourself or simply download my prebuild binary ARM deb packet for raspbian. 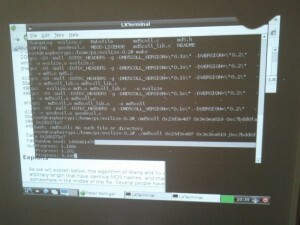 (MD5 hash: b530eb9ff97b9cf079f622efe46ce513) and install it. 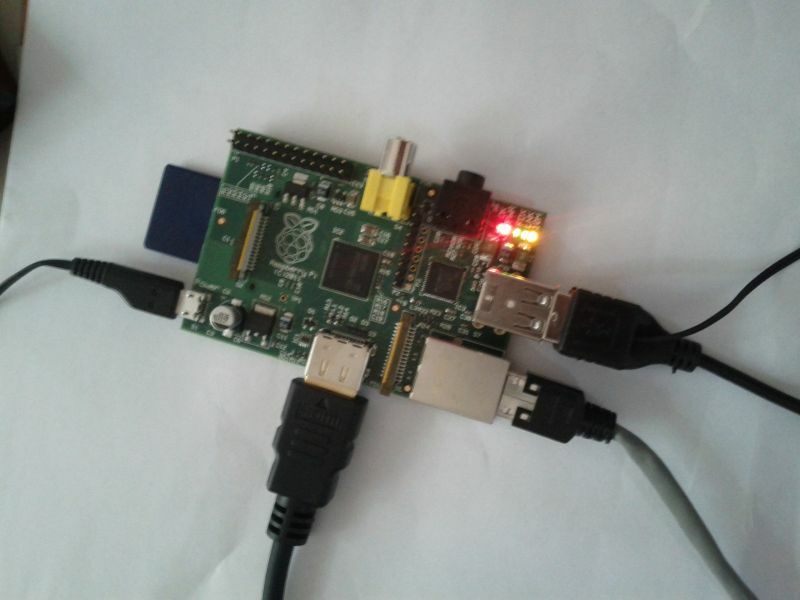 /usr/bin/espeak -vde "my I P address is $_IP"
The Raspberry Pi is a small ARM11 based board, (ARM1176JZF-S with ARMv6 instruction set), with 100 Mbit Ethernet port, HDMI, analog video, GPIO pins, SPI, I²C, UART and two USB interfaces. The processor is identical to the first genation Apple iPhone CPU. 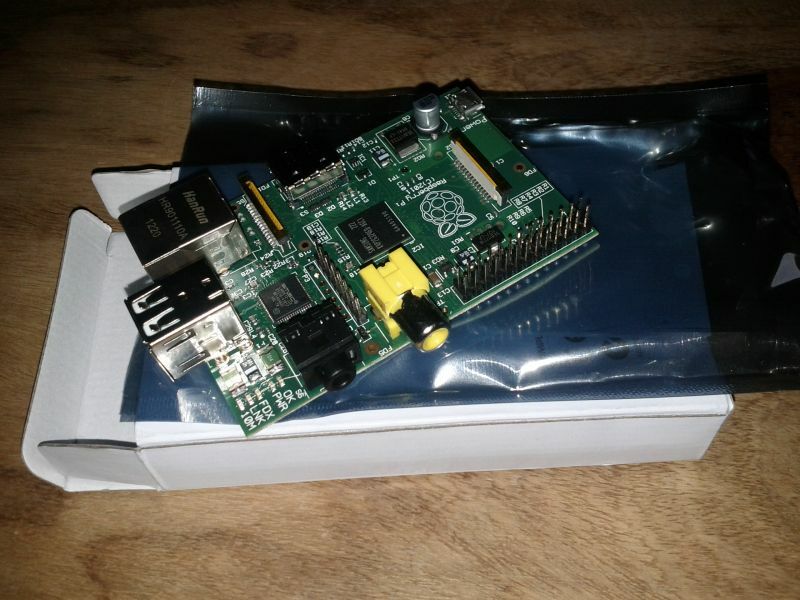 The Raspberry Pi just costs about 25-30 $ and was designed for educational use in mind. You can order the device in GB for 34 € with shipping to Germany and a T-shirt included. Because of the low power consumption (3,5 watt, fan less, no heat sink required) , its tiny size (credit card form factor) and the low price the Raspberry Pi is an ideal device for developing energy efficient solutions like NAS, routers and media centers. The Raspberry Pi uses am SD card as mass storage device, which can be deployed whith a proper Linux distribution like Raspbian “wheezy”, a modified Debian. The distribution consist out of a modern Linux with a resource optimized desktop and a slim Webkit based browser (Midori). Regardless the Raspberry was not designed for such a use case, it is fast enough to surf the Internet! 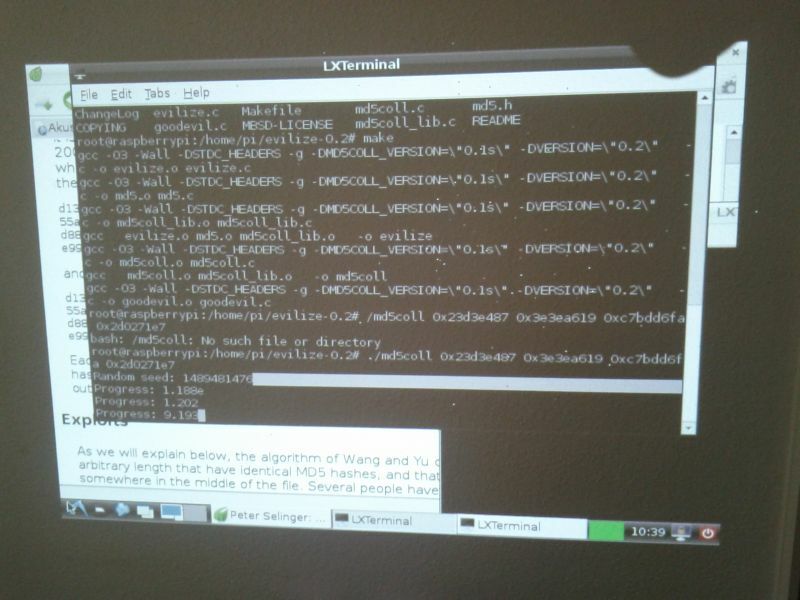 The custom Linux distribution Raspbian “wheezy” is strongly recommended because of the hardware floating point support for the ARM11 processor. The Debian ARM “arml” distribution (ARMv4t, ARMv5 and ARMv6 devices) version is lacks support for the hardware floating point capabilities of the Arm11 (ARMv6). The Debian “armhf” and the Ubuntu ARM distributions are supporting only ARMv7 instruction set devices (minimum ARM Cortex A8). Otherwise the floating point operations will be emulated in software, which is approximately 10 times slower. ARM processors, or on a Chip integrated ARM cores (System on a chip, SoC), driving mostly all current Android smartphones and tablets. The Apple-A5 SoC in the iPhone and iPad are also based on ARM cores. Apart of the processor for the user environment (e.g. Android or IOS) there are several other ARM cores integrated in a modern smartphone. Smaller energy efficient ARM cores are used for instance in the radio device of the phone, which executes all the GSM/UMTS/2G/3G communication tasks. Most of today’s Bluetooth and GPS chip sets contain a ARM core too. Likely your smantphone is equipped with four or more integrated ARM cores in different chip sets. The naming convention of the instruction sets of ARM processors should not be confused with naming of the ARM architecture (see http://en.wikipedia.org/wiki/ARM_architecture). Also the custom identification of ‘system on a chip’ (SoC) from different manufactures does not correspond to the standard ARM architecture naming conventions. This site gives some hints which ARM core is integrated in different SoC of common vendors. The site is very useful to compare the performance of common SoC which are integrated in Android tablets. To give you a hint: Don’t buy a device with a ARM core less than Cortex A8. Tablets with an ARM Cortex A8 CPU are available nowadays for ~ 100 €. But expect an iPad 3 like performance form a device with at least ARM Cortex A9 (ARMv7) with several cores. To test the computing performance of the Raspberry Pi ARM11 processor (ARMv6) I did not choose a standard benchmark but the MD5 Collision Demo from Peter Selinger. It implements a algorithm to attack a MD5 hash to compute a collision. These collisions are useful to create a second (hacked) binary (or document) with an identical hash value of a original binary. The algorithm always starts with a random number to compute a hash collision. In case of more processes of the algorithm on more CPUs or cores with different random start values, the chance to find a collision increases. The algorithm itself is not paralleled, but profits from different random start values. I have tested the Cray XT 6m supercomputer of the University of Duisburg-Essen in june 2010 with the same tasks before. I was limited to 300 of overall 4128 cores at that time. One of the cores found a hash value collision after 56 seconds. 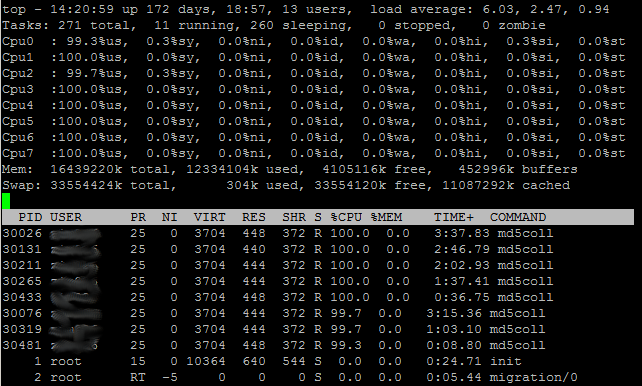 Oh the Cray it is easy to start such a job automatically on all available cores at a time. The small Raspberry Pi found a hash collision after 30 hours and 15 minutes. The algorithm is not a real benchmark, it is possible to get a disadvantageous random start value with bad luck. Two other runs ended each after 19 hours and 10 minutes and 29 hour and 28 minutes. But how the Rasberry Pi compares to the Cray in energy efficiency? 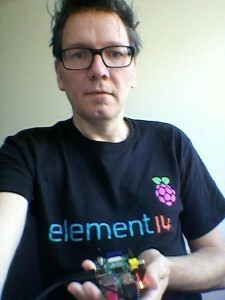 Raspberry Pi – cheaper and not so noisy but slower than a Cray supercomputer. Surprisingly similar energy drain in relation to the computation power. The two Cray Units at the University of Duisburg-Essen consume 40 kW each. To dissipate the heat the climatisation needs the same amount of engine power. Over all power consumption of the plant is about 160 KW. Relative to the 300 cores used in the experiment the power consumption is about 11.6 KW. In 56 seconds the plan uses 0.18 KWh of electrical energy. The Raspberry Pi power consumption is about 0,0035 KW, after 30,25 hours the energy usage is about 0.106 KWh. If I did not consider the energy for the climatisation, surprisingly the energy drain in relation to the computation power is more or less similar for both devices! The HTML5 audio tag is supported by iPhones, iPods and iPad since IOS3. Android supports HTML5 audio since version 2.3 gingerbread too. I was curious if the shared base of the browser in both worlds is usable to create a unique touch based interface for a web based application like the Pediaphon. Most of todays mobile web browsers (Android, Nokia S60, Palm Pre, Openmocko, … ) are relying of the free and open source Webkit rendering engine. Initially developed as rendering engine for KDE-KHTML later adopted by Apple and nowadays supported even by Google (Chrome and Android web browser) Webkit is a lean but powerful rendering engine not only for mobile devices. If you are reading this blog with a Mac you are actually using the Webkit rendering engine. A really lean Webkit based browser for Linux/Windows I can recommend is Midori. I am a great fan of the concept to prefer web based standardized applications to native apps for proprietary devices for e- and m-learning purposes. Development resources are usually rare especial at universities. It is always a good idea to focus on standard reusable HTML component rather than wasting time an effort for proprietary development app development. 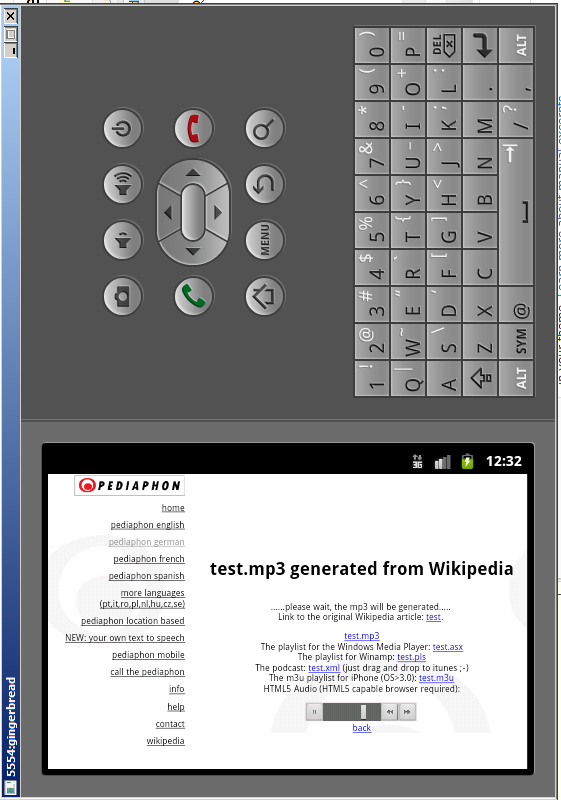 My first idea was to use the multi platform sencha touch framework for the Pediaphon (a text-to-speech service for the Wikipedia) touch interface. A colleague pointed me to iWebkit, which is originally targeting the iPhone but it performs also nice on other Webkit-based browsers, like Androids stock web browser. It provides a IOS like touch interface to all Webkit-based browsers, the web page look an feel is exactly like a native iPhone app. For the programmer or integrator iWebkit is a lean and simple solution, even rudimentary HTLM knowledge is sufficient to use it. Here the result, a touch interface for the Pediaphon, which converts Wikipedia articles into speech and realizes audio output just with the HTML5 audio tag, no plugin is required for IOS>=3 and Android 2.3 Gingerbread. For Android 2.2, which supports flash on some devices, there is still a flash option. 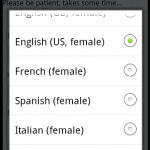 The Pediaphon mobile touch interface offers 5 languages so far, of course English is included . Try this link to use the map directly on your Android/IOS phone. 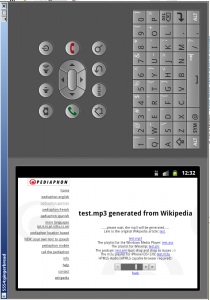 This example realizes a simple map with a marker at the users position in a webkit-based smartphone web browser. It can easily be extended to a simple moving map. It’s like Google maps mobile without Google (not really, runs on Android too and the embedded location provider in your Firefox PC browser is also Google. Believe me, just open about:config and filter for geo.wifi) And it is platform independent! Works perfectly on Android, iPhone, iPod touch and iPad too. Update: There is a new version with moving map available, view the source code on my German blog. A long awaited feature: The Android 2.3 gingerbread webkit browser supports HTML5 audio naively like Apple iPad and iPhone! Tested with the Pediaphon service on an emulated gingerbread device. On selected Android 2.1 and 2.2 devices like the Archos internet tablet 7.0 there is flash based audio support for the Pediaphon site too, but finally Android supports HTML5 audio naively. CeBIT fair(Germany, Hannover 2.-6.3.2010, hall 9/booth D06) this year. I will present at the ‘Innovationsland Nordrhein-Westfalen’ booth, a presentation of all universities located in North Rhine-Westphalia. I will share my booth with the ‘mobile learning project’ of the University of Hagen (FernUniversität in Hagen). Because of the lack of time I will only be at the booth between 4th-6th March 2010. Watch out for more languages! Coming soon! I am very proud to announce that Pediaphon is now part of a piece of art! available at ccmixter.org, a cool site which provides musicians with samples released under creative commons licence. The title of the song is ‘Ballad of Wiki’. Thank you very much Teru! Don’t miss Teru’s other mixes at ccmixter.org!